Spain, France, the UK and Germany put embattled Venezuelan leader Nicolas Maduro on notice ahead of an UN Security Council meeting on Saturday, saying they would recognise opposition leader Juan Guaido as president unless he calls elections within eight days. The ultimatum comes as international pressure mounts on the Maduro regime to agree to a new vote, after the United States, Canada and major South American players recognised Guaido, who proclaimed himself acting president of Venezuela during massive street rallies this week. ‘If within eight days there are no fair, free and transparent elections called in Venezuela, Spain will recognise Juan Guaido as Venezuelan president’ so that he himself can call such polls, Spanish Prime Minister Pedro Sánchez said in a televised announcement. French President Emmanuel Macron followed suit in a tweet, saying ‘the Venezuelan people must be able to freely decide on their future,’ as did German government spokeswoman Martina Fietz. UK Foreign Secretary Jeremy Hunt also joined the other EU nations in demanding new elections in Venezuela to be called within eight days, warning that otherwise London would recognise opposition leader Juan Guaido as president. ‘After banning opposition candidates, ballot box stuffing and counting irregularities in a deeply flawed election, it is clear (president) Nicolas Maduro is not the legitimate leader of Venezuela,’ Hunt said in a statement on Twitter. 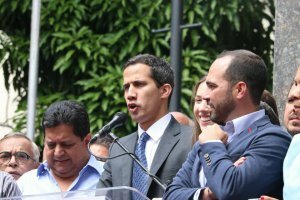 Guaido quickly welcomed the support from the European powerhouses. ‘There continues to be progress in the European Union for the recognition and full support of our legitimate and constitutional struggle,’ he tweeted. Spain had wanted the EU to take a tough line on Maduro by calling for immediate elections, failing which it wanted the bloc as a whole to recognise Guaido, the 35-year-old head of Venezuela’s National Assembly. Greece’s ruling party Syriza has publicly backed Maduro, with party secretary Panos Skourletis voicing ‘full support and solidarity’ to what to he called ‘the legal president’. Maduro also has the support of Russia, whose foreign minister Sergei Lavrov denounced US policy on Venezuela as ‘destructive’. Maduro’s re-election last year was contested by the opposition and rejected by the US, EU and UN as a sham – but he has until now retained the loyalty of the powerful military. In a Skype interview with Univision late Thursday he went one step further by suggesting Maduro could be offered amnesty if he agrees to step down. He has however rejected an offer of talks with Maduro, saying he won’t attend a ‘fake dialogue’ on a crisis that has left 26 dead in clashes this week between anti-Maduro activists and security forces. Guaido has acalled for another ‘major demonstration’ next week. Maduro, for his part, called for a ‘popular rebellion against the coup’ on the streets of Venezuela. The Inter-American Human Rights Commission late Friday issued a statement warning that Guaido’s life and health were in danger given the high political tension in the country.